If you own an RV, motor home, or camper you are certainly well aware of how necessary it is to protect your investment. When you’re not on the road, it is a good idea to have a safe place to store your home away from home. RV garage plans offer the perfect solution! These floor plans are specifically designed to protect your investment from the elements and keep it in good condition. They feature at least one garage bay that is wider, deeper and taller than a typical garage bay so it can accommodate the overall size of a recreational vehicle. RV garage plans are available in a broad range of sizes and styles. While some simply offer an RV bay, others offer special extras like a workbench, half or full bath, storage space or workshop area. Some even offer a garage apartment on the second floor. Below are five of the newest RV garage plans we’ve added to our site. Take some time to discover what each one has to offer. You just might find that one of these new RV garage plans will satisfy your needs. 051G-0086 If you need sheltered parking for more vehicles than just your RV, this detached RV garage plan is worth considering. It offers an RV bay with a vaulted ceiling plus an attached two-car garage with extra work or storage space. It provides plenty of room for your everyday cars as well as space for the family bikes, recycling bins, lawn mower or garden tools. 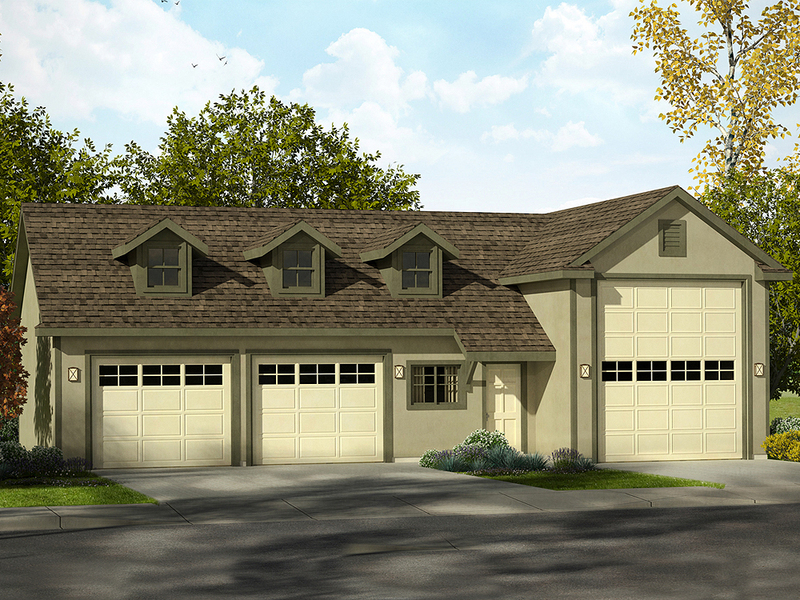 Its flexible design allows this RV garage plan to accommodate a wide variety of needs. 006G-0159 For those who need just a little extra parking and a place to keep their recreational vehicle safe from the elements, this RV garage plan just might fit the bill. It offers an RV bay with 12” ceiling on the left and a 1-car garage on the right. A covered entry offers convenience. It’s simple design blends nicely with a variety of architectural home styles. 072G- 0035 Do you spend a good part of the year on the road traveling from place to place? If so, maybe you need a place to call “home base” for the times when you are not traveling. 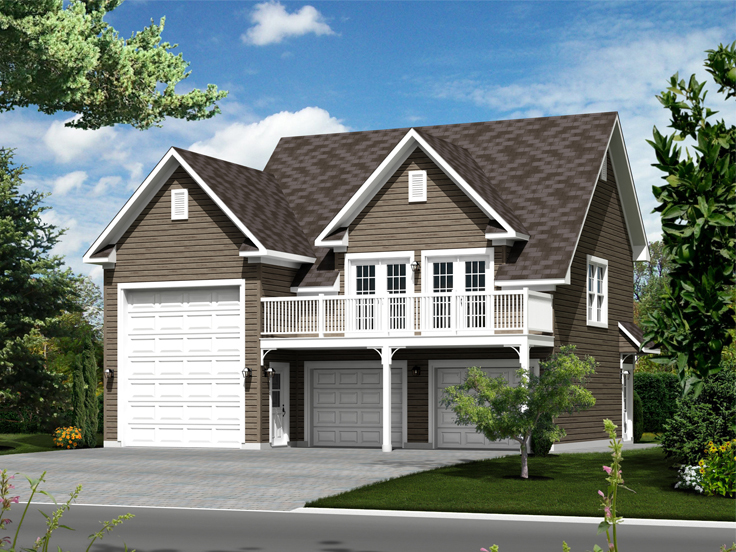 This RV garage plan with second floor apartment might be the perfect design for you. The main floor offers an RV bay giving you a place to store your RV or motor home when you’re not on the road and a two-car garage for your everyday vehicles. The second floor features an efficiency apartment outfitted with one bedroom, one bath, a compact kitchen and room for a stackable washer/dryer unit. 062G-0053 Maybe you own an RV or camper along with a variety of other motorized vehicles that you’d like to protect from the elements. This double RV garage plan features plenty of storage space. It is designed to accommodate two RVs, campers or motor homes, or it can be used for extra storage space. Just imagine one bay for RV storage and the other bay for boat storage or parking a pair of cars tandem style. The second bay could easily be used for smaller items like a golf cart, ATV, motorcycle and more. Additionally, it could be used for a workshop area or hobby space. Designed with a simple floor plan, this RV garage is flexible and well-suited for more uses than you might expect! 007G-0021 Don’t be fooled by this RV garage plan. While it may have the looks of a barn or a 2-car garage, it has more to offer than meets the eye. 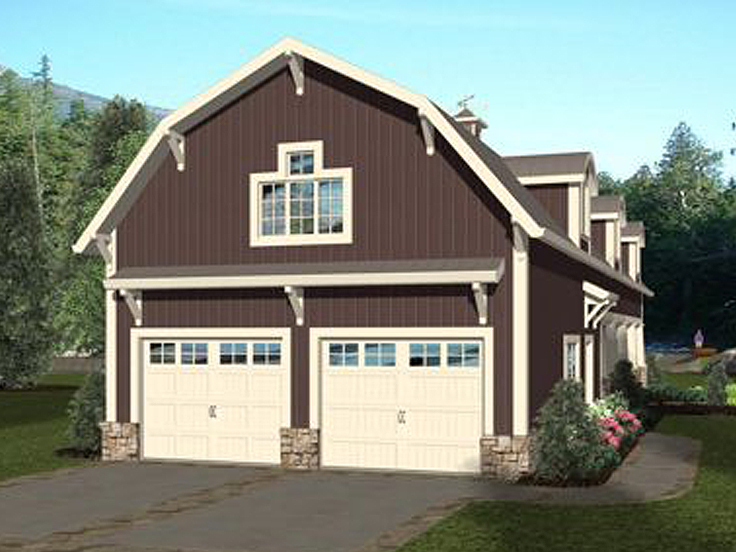 This carefully designed RV garage apartment plan is filled with surprises. The main floor offers a 2-car garage on one end and RV garage bay that enters from the other end. Additionally, a covered porch provides a place to relax outdoors or fire up the grill. Interior stairs lead to the second floor living quarters. Here’s you’ll find a carefully designed apartment outfitted with one bedroom, two full baths, a compact kitchen, sitting area, game room and three bunk areas. You might also consider this RV garage plans for boat and trailer storage or for installing an auto lift to work are cars. If you are looking for a less expensive way to protect your RV from the elements, you might consider an RV carport plan instead. For more options, take some time to browse our entire collection of RV garage plans.